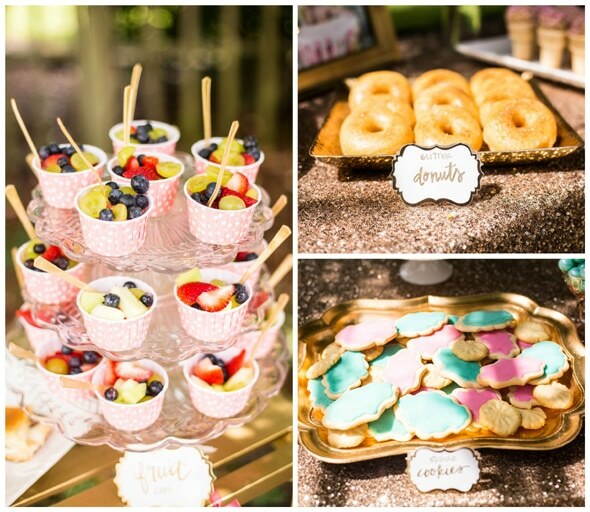 This Glitter and Gold First Birthday was ONE spectacular celebration! 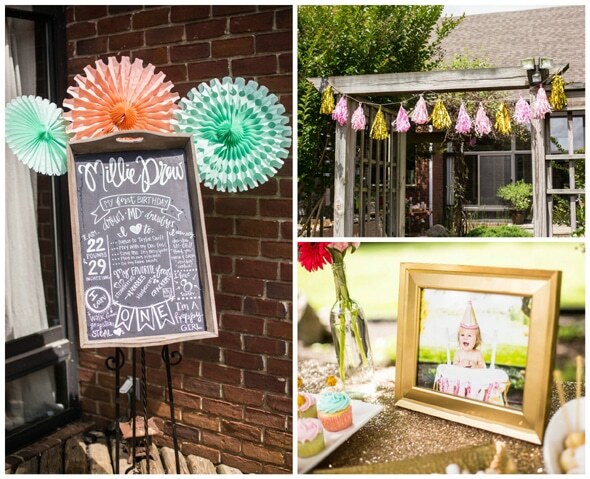 BettsMade did an amazing job creating the most magical girly party for a special 1-year-old! 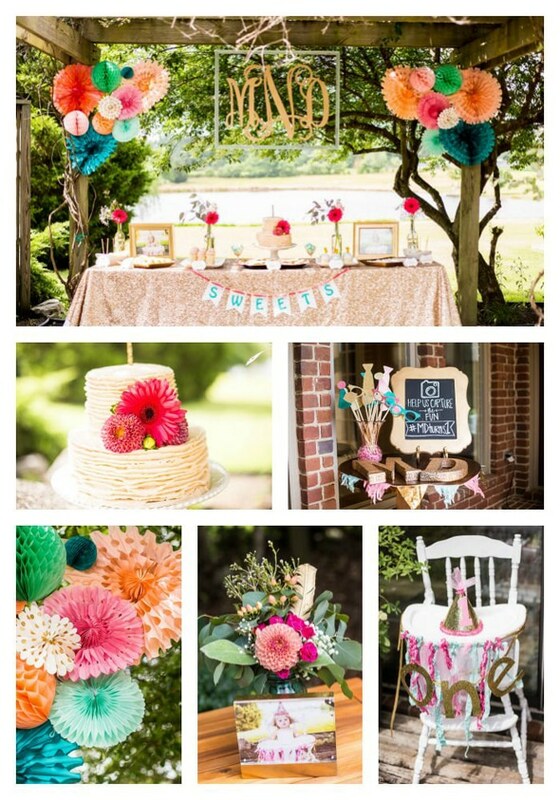 Everything from the glitter to the flowers and vibrant colors made this party one to remember! From Party Planner – BettsMade: Millie Drew is nothing shy of spectacular, so her party definitely had to be! Millie Drew loves all things GIRLY: pink, sweets, glitter, more glitter, and sparkles! Everything for the party was girly and if we could put glitter on it, well then we did! 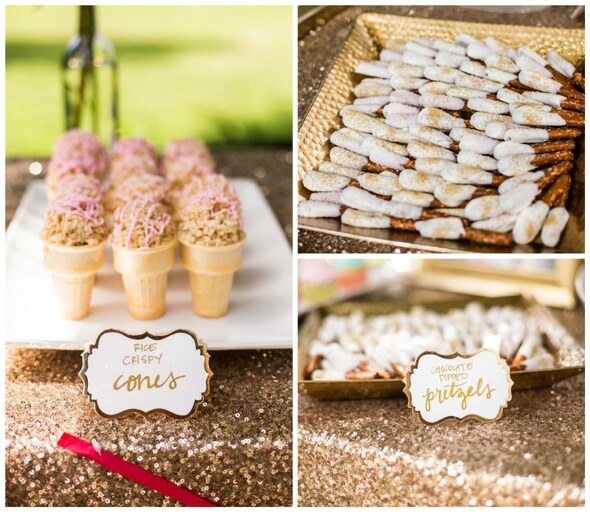 Her party theme was Glitter and Gold and all things ONE! We had mainly sweets for our guest to eat: glittered donuts, iced sugar cookies, cupcakes, rice krispie treats, and cake. 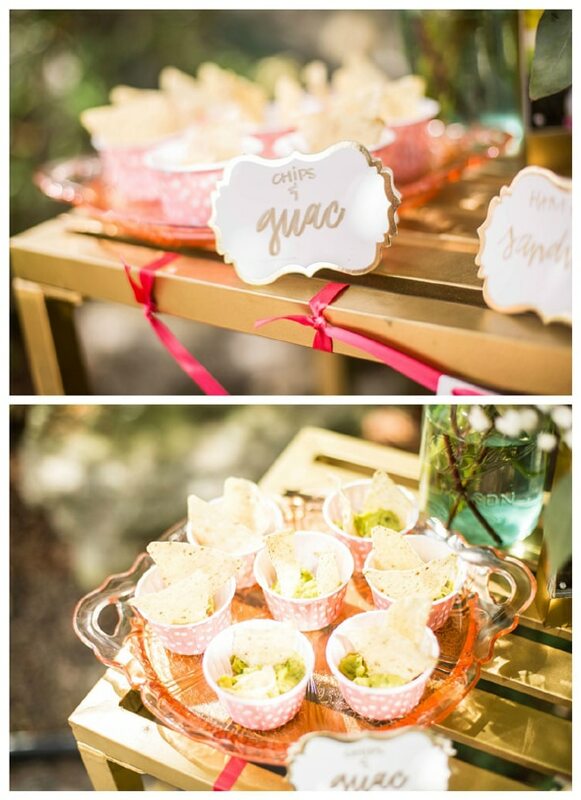 We offered strawberry lemonade and water for drinks and for the party favors we had 2 different options: bags filled with Millie Drew’s great-grandmother’s homemade sugar cookies and/or bags of popcorn where guest got to add all kinds of toppings to make it extra yummy! 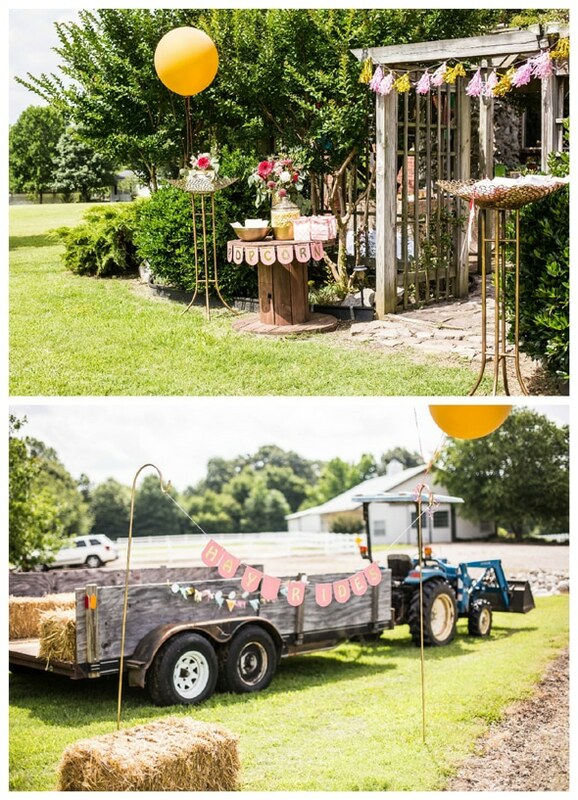 Guest enjoyed a really girly tractor ride that consisted of gold confetti being thrown everywhere and they also enjoyed yard games that were set up in the field. Everyone had a BLAST at Millie Drew’s Birthday Bash! 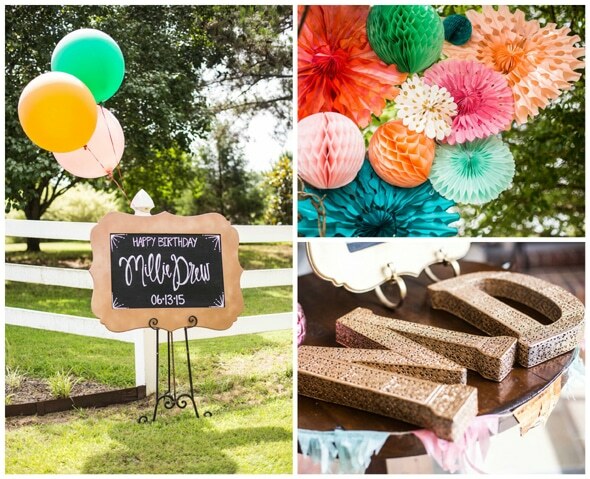 We love how the adorable little birthday girl’s photo was seen throughout the party and the chalkboard sign greeted guests, which was filled with fun details of the guest of honor … Ms. Millie Drew! 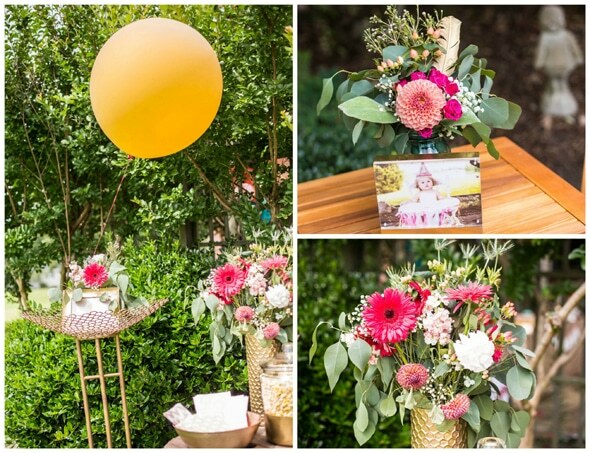 Gorgeous flowers in pretty gold vases were the perfect touch to this outdoor celebration! 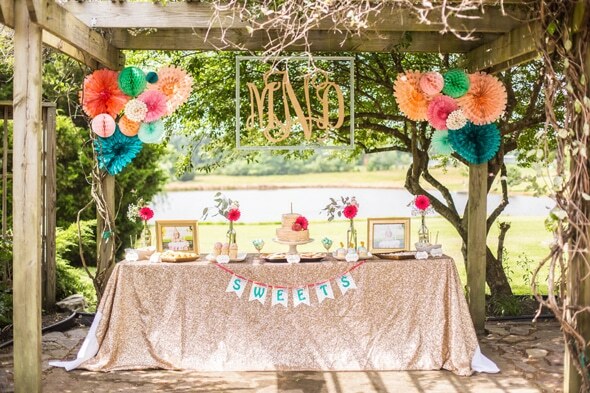 The jaw-dropping sweets table was definitely a showstopper with a glittery gold table cover, colorful tissue fans and honeycomb decorations, and the monogrammed sign that hung above the table. Amazing! 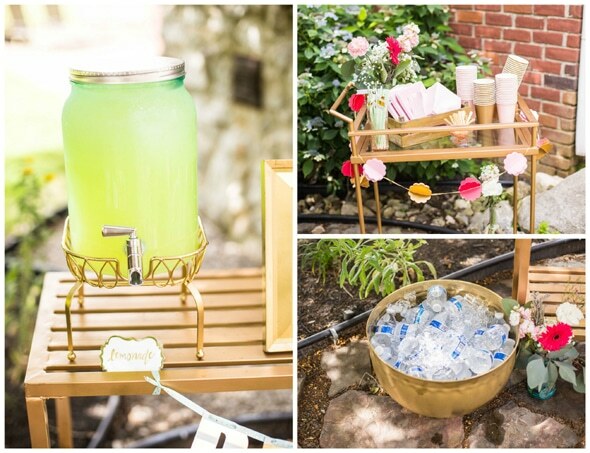 Something like this would also work for a bridal shower, sweet 16, or a baby shower! 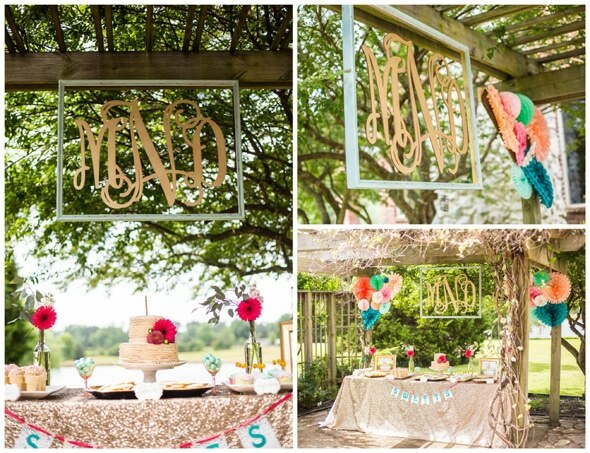 The gold monogram in a mint frame served as the perfect backdrop for the dessert table. 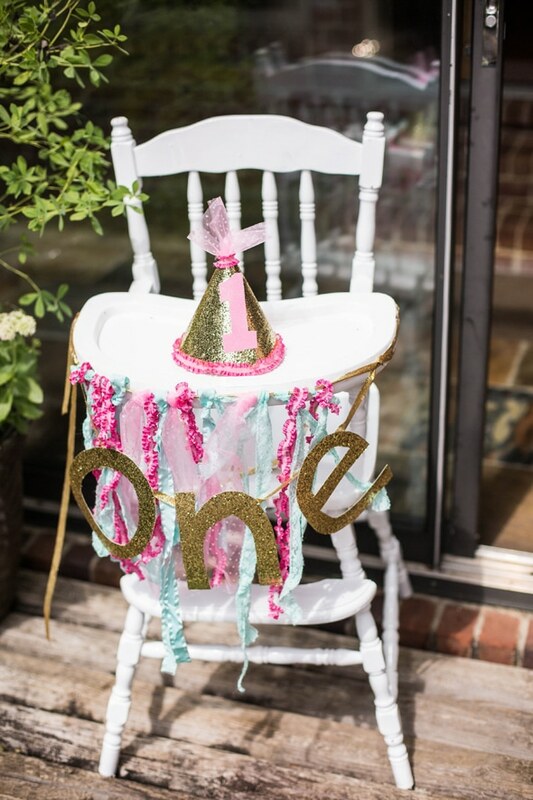 The adorable birthday girl’s vintage white high chair was decorated in true girly fashion with pretty streamers and a gold glitter “one” banner! And of course she had a fabulous “one” hat to match! 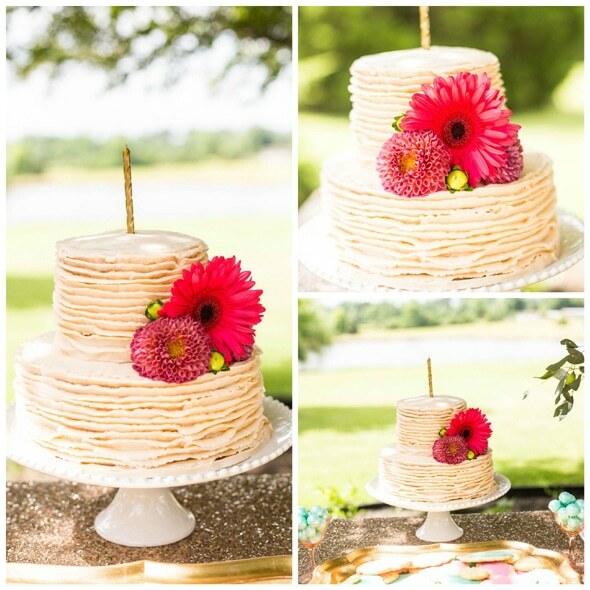 The pretty ruffled cake was adorned with bright colorful flowers and was topped with a gold candle. Perfection! 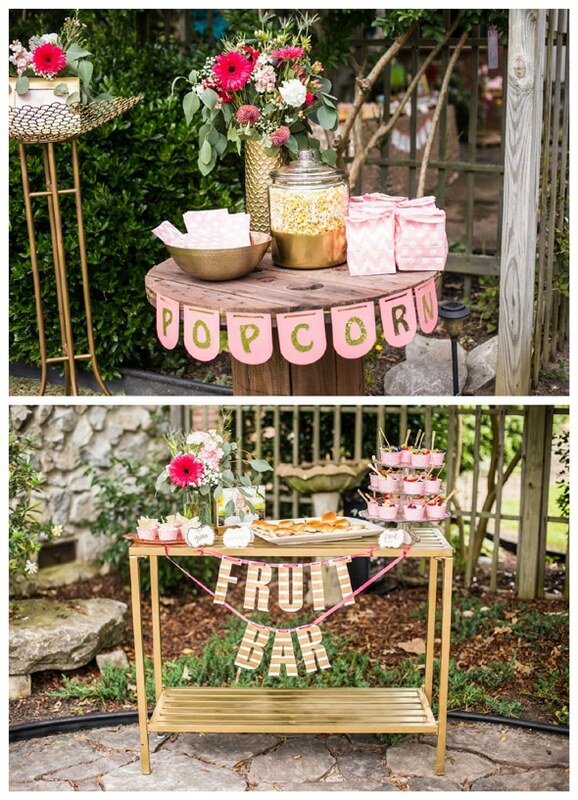 A fun popcorn bar and fruit bar were just the icing on the cake! So fun! Donuts, cookies, rice krispie cones, and pretzels were just some of the delicious desserts on hand for guests to enjoy! 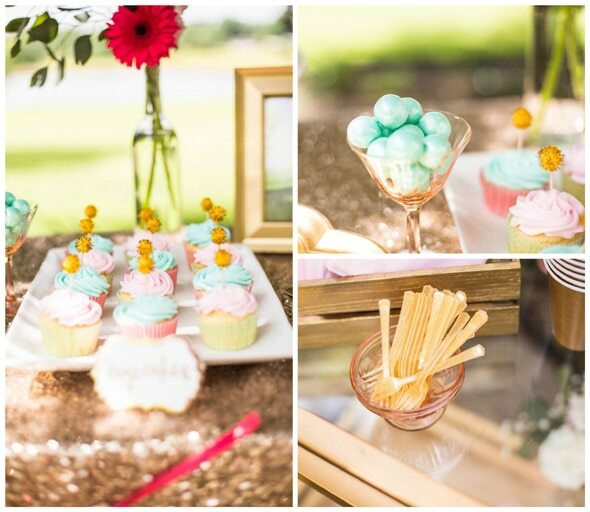 Cute gold pom toppers adorned the blue and pink cupcakes. 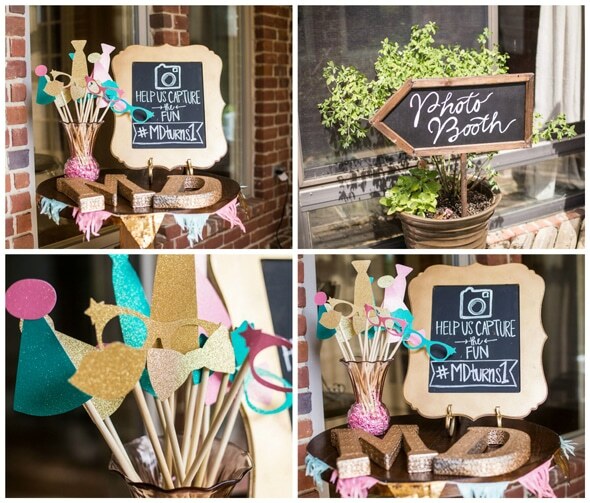 A fun and girly photo booth was set up with glittery props so guests were able to strike a pose! What a great way to capture all of the fun! The fun doesn’t stop there … tractor rides with glitter tossing was on the agenda! FUN! 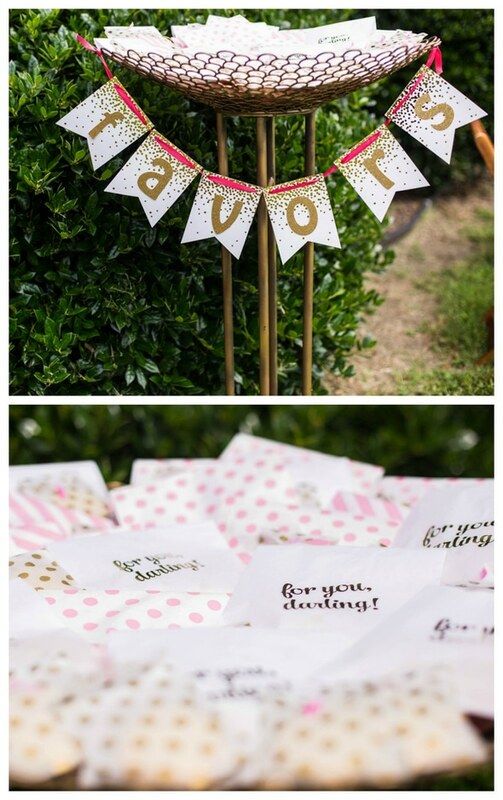 Cookie and popcorn favors were given to guests to enjoy at home in adorable “for you darling” favor bags. How sweet! What a truly wonderful first birthday party for a very special little girl. We can’t wait to see what her second birthday is going to look like! Plan the most amazing party with these products that were hand-picked by our editors! So amazing! 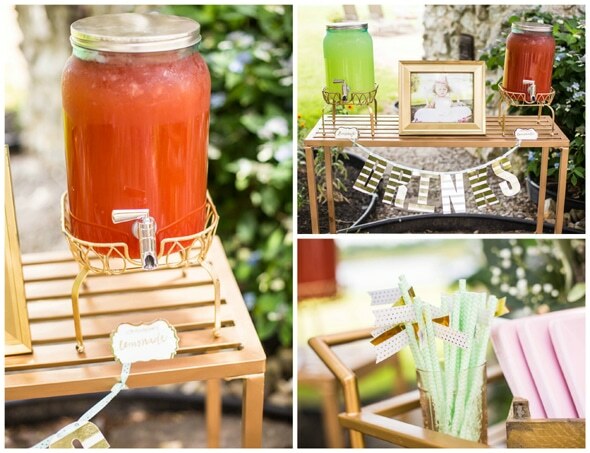 The details are simple yet add up perfectly to a fantastic party theme.